I’ll be talking about my experience as a caregiver using the iPad to engage and communicate with my wife, at Arden Courts in Avon tomorrow, October 3, noon to 1:30. They will be providing lunch. Keeping a loved one with dementia engaged in activities is very challenging for caregivers. Ed Fitzgerald, a technology consultant whose wife is living with Frontotem-poral Dementia, looked for ways to use technology to help her. After some trial and error, he began using the iPad and created a home screen of activities combining, apps, links, games, videos, pictures and more, which he uses when they are together. During this seminar, Ed will demonstrate how he uses the iPad, the process by which he created a customized set of activities that are of interest to his wife and offer advice on how to proceed if someone is interested in pursuing it with their loved one. He talks about getting other family members involved and the benefits to both the loved one and caregiver. While he uses an iPad, some of what he talks about applies to a Kindle and Nook as well. I’ll be talking about my experience as a caregiver using the iPad to engage and communicate with my wife, at a fundraiser for the Alzheimer’s Association at the Arden Courts in Hamden on September 17th, 5:30 – 7:30pm. Here is the announcement from Arden Courts. The event is open to the public. “Join us for this event in which all proceeds will benefit the Alzheimer’s Association’s 2015 Memory Walk. Delicious pasta dinners donated by Sapori d’Italia in Hamden and Michaelangelo Pizza & Subs in West Haven will be served for $10.00 donation per person. You can either dine in or take dinner home with you. 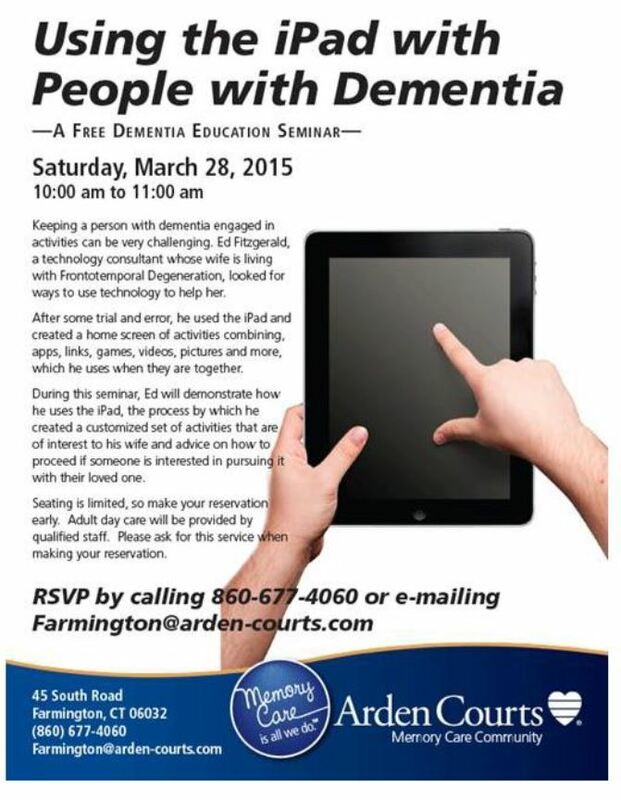 There will also be a discussion with guest speaker Ed Fitzgerald regarding how families (grandchildren, children or adults) can interact with their loved ones with Alzheimer’s/dementia using iPad screen activities and applications. You are invited to this seminar at the Norwalk Senior Center on September 1 from 10:30 to 11:30am. The Center is located at 11 Allen Road in Norwalk. “Keeping a person with dementia engaged in activities can be very challenging. Ed Fitzgerald, a technology consultant whose wife is living with Frontotemporal Dementia, looked for ways to use technology to help her. After some trial and error, he began using the iPad and created a home screen of activities combining, apps, links, games, videos, pictures and more, which he uses when they are together. The seminar is sponsored by the Norwalk Senior Center Dementia Caregiver Support Group. Keeping a person with dementia engaged in activities can be very challenging. Ed Fitzgerald, a technology consultant, whose wife has a rare form of dementia called Frontotemporal Degeneration, looked for ways to use technology to help her. After some trial and error, he focused on the iPad and created a home screen of activities combining, apps, links, games, videos, pictures and more, that he uses when they are together. Ed will demonstrate how he uses the iPad, the process by which he created a customized set of activities that are of interest to his wife and advice on how to proceed if someone is interested in pursuing it with their loved one. This month the CT PC Users Group will be hosting a special presentation I will be making. Here is their announcement. Date/Time: March 24, 6:30 to 8:30pm. Location: United Congregational Church of Norwalk, 275 Richards Avenue. Keeping a person with dementia engaged in activities can be very challenging. CTPC member Ed Fitzgerald, a technology consultant, whose wife has a rare form of dementia called Frontotemporal Degeneration, looked for ways to use technology to help her. He also sees its potential to be used with groups of people, and has been invited to support groups and assisted living facilities to demonstrate to caregivers, staff and loved ones. The Connecticut PC Users Group (CTPC) is a non-profit, volunteer organization formed originally to share information related to the use of PC’s. It now covers the spectrum of information technologies and devices. It has been in existence since 1981. Meetings are open to the public and there is no charge to attend. The group meets at 6:30pm on the fourth Tuesday of each month (except December).